Since the launch of the Greater Downtown Dayton Plan, more than $600 million has been invested in downtown, and a significant amount of that investment has created new downtown housing options. With $600 million more in projects in the pipeline, downtown Dayton is coming back, and the growing demand for downtown housing is one of the core initiatives pushing development momentum forward. Currently, downtown sits at one of the highest apartment and condo occupancy rates in the region. However, with so much new housing, the question of sustainability arises. How deep is the downtown Dayton housing market? Can we absorb all of the proposed new units? 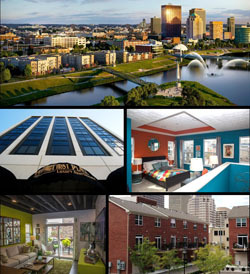 How does urban living in Dayton compare with other downtowns our size? The Downtown Dayton Partnership has published a housing demand analysis to begin to address these questions. As this study demonstrates, downtown Dayton’s residential market has significant depth beyond the housing that has been added over the past several years and the housing currently in the development pipeline. Certainly as some of the current projects get underway closer to completion – Levitt Pavilion, the Arcade, Fire Blocks, Centre City, Water Street – the momentum around choosing a downtown address will only build. Download the Downtown Dayton Housing Demand Analysis Report from March 2017.